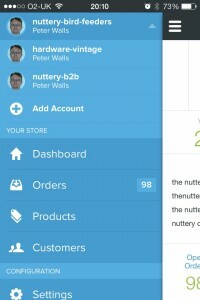 The newly updated Shopify Mobile App allows you to manage and monitor one or more Shopify store from your iPhone or iPad (iOS 6). US customers can also use the app to take payments. The first step is to setup the app with the username and password for one or more stores. Once this is done the app will startup on a handy Dashboard page that will show your sales, orders, and visitors for the current day (see screenshot). 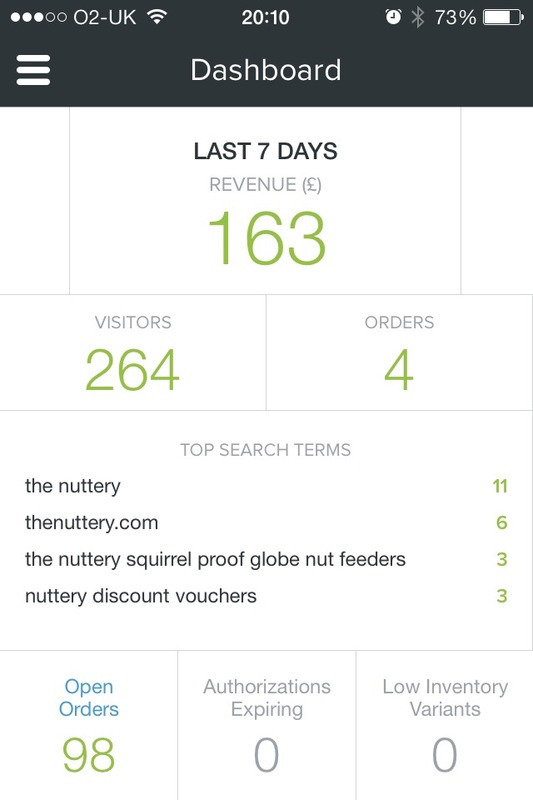 The dashboard also shows the total number of open orders, the number of products with low inventory, and the top search terms used to find your site. Swiping leftwards will change the dashboard to show yesterday’s figures, the last week’s, the last 30 days, and the last 90 days. The dashboard gives you a high level overview your store and gives you all the stats you need to compare recent performance to past performance and flag up problems as they occur. Swiping on the far left edge of the app brings up a control panel. The panel shows all the accounts that you’ve setup and you can choose between them here. 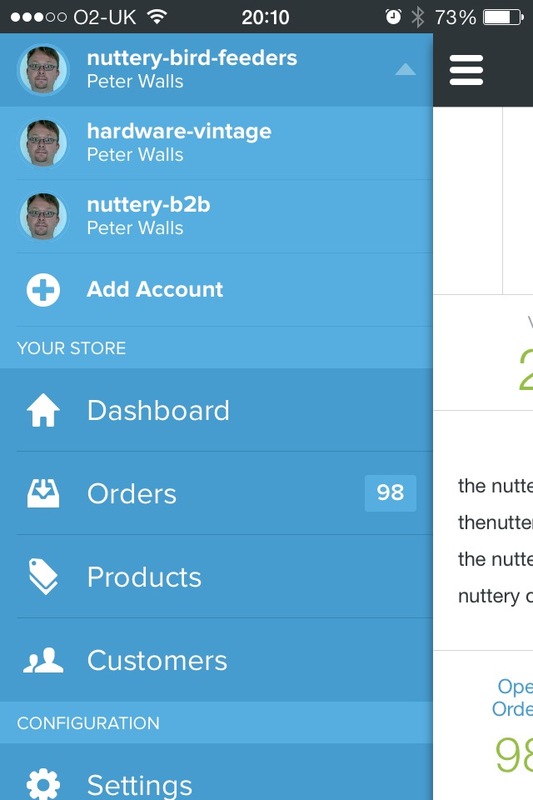 More usefully you can leave the dashboard and show detailed screens of your orders, your customers or your products. This screenshot shows the product view. 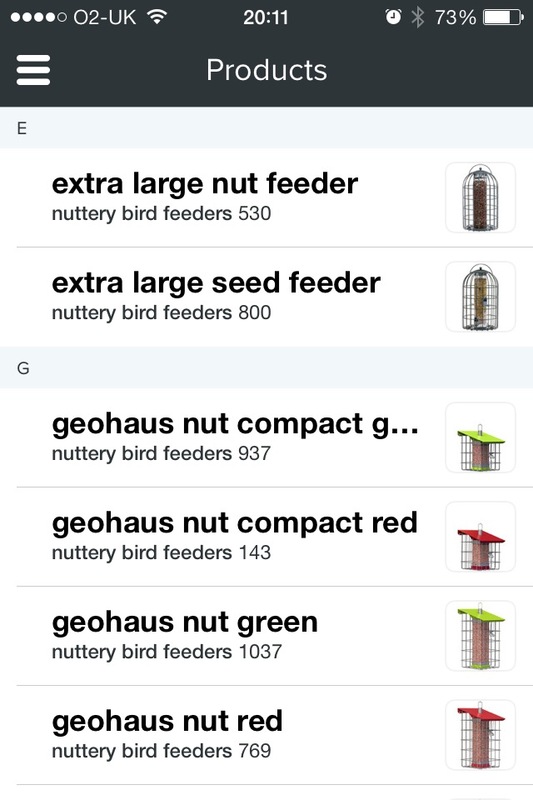 You can see all your products in alphabetical order, with a thumbnail image and the number of items in stock. 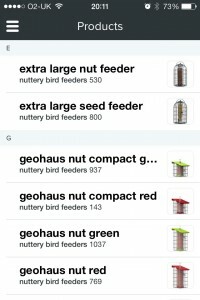 Clicking on one of these entries will bring up the full product page, it will show all the images you have uploaded for the product and the full product description. It is even possible to edit some features of the product and you can add new variants.The order and customer pages are similar, showing a list of entries with the option to click on the to bring up details about the order or customer. US customers get the useful extra functionality of accepting orders and taking payment from the phone or tablet. Obviously this is a hugely useful feature which turns your mobile device into a portable outlet for your e–commerce shop. I hope we see this feature in UK as soon as possible. 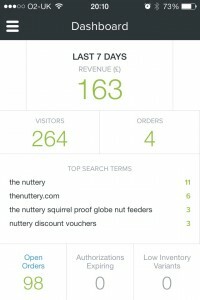 Overall the app is a useful addition to your Shopify toolset. It allows you to monitor the store and keep on top of issues as they arrive. The ability to drill into details of products, customers, and orders means that you can support your store from remote without access to a desktop or laptop. You can, at a push, follow up on customer calls and queries from anywhere.